Dartmoor is a haunted national park in Devon, England, it covers over 350 square miles and although one of the largest is one of the least visited. Within its borders can be found, a haunted castle, the ruins of a church burnt down by Satanists, and the remains of a medieval village decimated by the plague. It is a desolate foreboding landscape full of strange rock formations, Stone Age remains and numerous ghosts and legends. As far as places go in England, for me haunted Dartmoor is one of the most interesting. You don’t get the crowds of people that you would in a city and it is impossible to drive more then a few miles without encountering a location associated with a haunting, or unexplained occurrence. It is just over a 2 and 1/2 hour drive from my home in Winchester and whether you see a ghost or not the landscape of the park is unique and mysterious. You have spectacular views, rivers, waterfalls, Stone Age ruins a nd even a Napoleonic era prison sitting in its center which is still in use today. But there is a strange atmosphere about the place that I have rarely come across anywhere else, particularly when the mists role in over the moors, and it was certainly inspiring enough for Sir Arthur Conan Doyle to incorporate many of the parks locations in the book Hound of the Baskervilles. If you have watched the movie American Werewolf in London and remember the scene just after the two hitchhikers are warned not to wander off the path before leaving the Slaughtered Lamb Pub, haunted Dartmoor could be the place that they wander to. I entered from the South side near Buckfastleigh. Just beyond that is my first stop, the Holy Trinity Church, but it’s not easy to find and in a very secluded location. A hill slopes up from the village below, and at its crest there is a crossroads. At the intersection is a small wood sign saying “church” that points the way to the right. I headed down the single track road about a ¼ of a mile and parked the car next to the entrance. It is very quiet, but there is something abnormally quiet about the area. I made my way through the archway at the front, and along the pathway that leads through the graveyard, the almost complete silence makes my footsteps seem louder then they are. From a distance the stone building ahead looks like most other country churches, but as you get closer you can see that the structure is just a shell. The reason for this and why it maintains its sinister reputation is that it was burnt down in 1992 and that Satanists where rumored to have been responsible. It was believed that under cover of night Black Magic rituals were practiced here for many years and that what once was holy ground is now spiritually contaminated. As I walked onward down the gravel path towards the building I could see that the roof is missing, the stain glass windows are also gone, and there are just stone silhouettes where they once were. Most of the graves are traditional crosses or rounded tombstones, but there i s one just ahead to the right that is far out of keeping with the others. 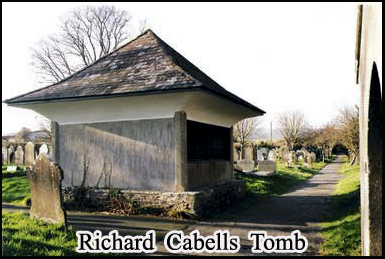 Many believe that the tomb and the man buried beneath it are why devil worshipers were drawn here, and that its occupant Richard Cabell may have been the inspiration for the “Evil squire” depicted in the book Hound of the Baskervilles. I was now just level with what once the main entrance to the church; just to the right of the path is a large stone crypt several feet across, with a slate roof. Along its front are black wrought iron bars and if you look through the bars you can see a stone vault. It is in this vault that Squire Richard Cabell now lays, he was an unpopular local land owner that died in the 17th century. During his life he had often hunted with his pack of dogs, and almost immediately after his death there began legends that told of him leading a pack of phantom hounds with glowing red eyes across the surrounding moors. Soon after he was buried a massive slab of granite was placed on his tomb, supposedly to stop him from rising from the dead. 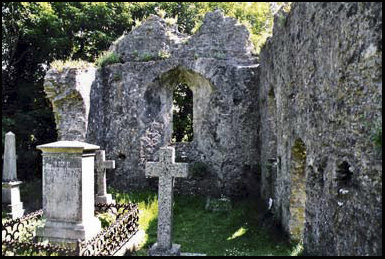 These are some of the reasons that many believe that the character of Sir Henry Baskerville from the book Hound of the Baskervilles may have been based upon Richard Cabell, as Sir Arthur Conan Doyle had been staying in Princetown only a few miles away in the center of the haunted Dartmoor National Park when he began his research. Another of the stories surrounding Squire Cabell tell of the iron railings around his vault glowing at night as if they were on fire, and that if you walk around the tomb 7 times and ask the devil to appear he will oblige. The crypt does look completely out of place in the churchyard, looking more like a Victorian Foley, among the far smaller less noticeable graves. But with its secluded location and rich folklore it takes no stretch of the imagination to believe that the church and its grounds were once used for satanic practices, and indeed that they still maybe. I proceeded past the tomb and through the stone archway that was once the main door to the church. After the fire in 1992 the outer walls still remained intact, but it was the roof, doors and windows that cracked or burned and now expose the building to the elements. The stone paving slabs of the original floor still remain; some of them are engraved, although the writing is faint and unreadable. There has been some effort made at a partial restoration of the church but the damage was so great that it is unlikely that it will ever be fully rebuilt. The small area below the steeple has been enclosed and there is a locked door that leads to the bell tower. The bells are occasionally rung, and parishioners are still buried in the graveyard. But there is an uneasy atmosphere about the place, and although a congregation would have gathered here regularly for literally hundreds of years it just feels that the time for that has passed. I was the only one in the church and standing alone in the middle of this now hollow shell you try and picture what once was the center of a community. There would have been births, christenings, marriages and funerals over a period of several generations until the chain was broken by the fire in the early 90’s. But the church does feel that it is now irreversibly detached from its own past. I was just making my way across to the other side of the courtyard when I noticed a strange circle of stones in one corner. In the middle was a black candle that had been burnt almost down to its base. It did not have the appearance of a fire started for someone to keep warm by, there was no signs that any wood had been burnt and it certainly did look as if it had some sort of ritual purpose, but if it was satanic or not I don’t know. The Church is unique in the fact that although it would be considered a ruin, it is far more then just a few piles of bricks, or some overgrown crumbling foundations. It was only fairly recently in its history that it fell into disrepair and you can still wander around the building through the doors and arches and along the center of the knave where rows of pews used to stand. But if you look above you see the sky, and if you look through the windows their stone frames are intact but have no glass in them. It must be an eerie place at night when the light from the moon shines down upon the empty interior, and above you are the stars. I’m not sure of the reasons that the church was not rebuilt, but maybe in this instance the damage done would have taken more then bricks and mortar to repair. I walked back out through the opposite side of the remains and circled around through to the path., before making my way among the tombstones back to the main entrance. Next stop on my trip through haunted Dartmoor was Hound Tor. If you head north into the park on the road to Widecombe upon the Moor there is a turn off to your right that leads to a rock formation called Hound Tor. I stopped off here for a few minutes on my way to Jays Grave. 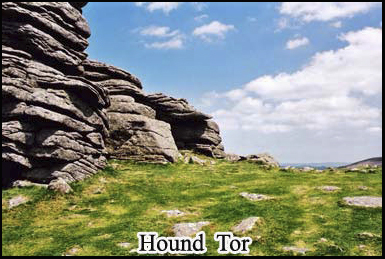 Hound Tor is also associated with legends of phantom hounds, and the Sherlock Holmes novel Hound of the Baskervilles. It is here that in the book a convict that had escaped from nearby Dartmoor prison, hid among the stones. I walked up to the top of the hill where the huge rocks and boulders overlook a valley that at that time of year was covered in a sea of purple flowers, in its shadow are the ruins of a medieval village whose population was decimated by the plague. 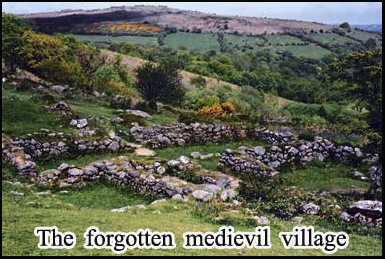 A lot of people come to Hound Tor but aren’t even aware of the abandoned village below it. It’s about a fifteen minute walk down the hill and there are several distinct brick foundations that were once buildings scattered over a few hundred yards, it must have been a very inhospitable place to live, and once its inhabitants were wiped out by disease, no one returned. I took some pictures and then headed back up the hill around to the side of the Tor. As you drive along the road past Hound Tor it narrows considerably and branches to the left. This is a road that few people travel, and it makes the area around Jay’s grave seem all the more desolate. After about a 1/4 of a mile there is a small gap in the wall on the left hand side and in the middle of a dirt track is a mound of earth with a stone slab protruding from it. 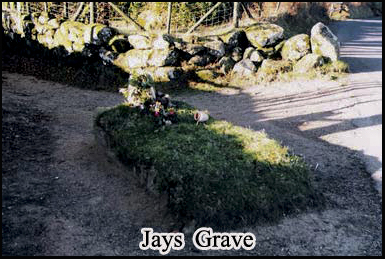 This is Jay’s grave one of the most infamous places in haunted Dartmoor. On both sides a low stone wall runs along the edge of the moor, but there is no church, no houses and no other tombstones. Unless you were specifically looking for this grave you would probably drive right past it. The dirt track crosses the main road to the right hand side which is where I park the car. It intersects with the road and this does in fact make this a crossroads, which is part of the legend. It was once believed the reason that someone was buried at a crossroads was that it was to confuse evil spirits that may try and take their sole, and that if someone was buried there such as a vampire or a witch, that if they rose from the grave they themselves would be unable to know which road to take back to the mortal world. Jay’s grave holds the body of a young girl that committed suicide in the 1700s, and because suicide was at that time considered to be an ungodly act in the eyes of the church, the victim was often buried at a crossroads. This would have been unconsecrated ground it, and it was also commonplace to drive a stake through the heart of the deceased to keep them there, which according to legend is what happened to Kitty Jay. The story of Kitty Jay involves that of a young farm girl that got pregnant by the son of the wealthy land owner whom she worked for. He refused to marry her and because having a child out of wedlock at that time was considered unacceptable by both the church and her own family, in a depressed state the girl hung herself in a barn. Because she was a suicide she was not given a Christian burial. Many years after she died the current owner of the land on which Kitty’s grave still lies, dug it up to see if there was actually anyone buried in it or if it was just another haunted Dartmoor myth. According to reports skeletal remains matching those of a young girl where exhumed, which were then reburied and a tombstone added to mark the location. I walked across the road to the grave, among other things, placed on the grassy mound were some fresh flowers. The flo wers are another part of the tale of Kitty Jay, and although they have been placed here for many years the story goes that no one ever sees who does it. Sometimes other artifacts are left at the burial mound such as children’s toys for Kitty’s unborn child, and leaving coins are supposed to bring passing travelers good luck. Behind the grave the track leads to a steel gate and there is a line of trees leading off along the road into the distance, I was at the grave about twenty minutes and not a single car passed. I have stopped by here at night and it is so quiet and isolated that you won’t hear a sound, and it is at night when people have often reported seeing a shadowy figure kneeling by Kitty’s grave. The drive along the road ahead is full of overhanging trees and blind turns and even in the daytime you can’t go at more then a few miles an hour, after the sun has set the darkness seems impenetrable and the road is the wrong one to take if you want to make a quick escape from whatever you may have encountered. 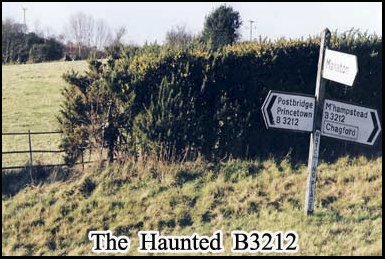 I got back in the car taking the narrow single track lane in front of me and eventually I came out on the B3212, this particular stretch of road is haunted by a pair of phantom hands. In the 1920’s there were so many reports of these unseen hands grabbing the steering wheels of passing cars and forcing them off the road that it became a major story in one of Britain’s national newspapers the Daily Mail. After a few more miles I came to a fork in the road and turned off towards Princeton. In the distance a vast grim looking grey concrete building comes into view, this is the haunted Dartmoor prison. It was originally built in 1809 to house prisoners both from the American Civil War and those captured during the war with France. Today it is still in use, and in recent years has housed some of the most dangerous prisoners in England. Just as I pass through the town on the left hand side is the Dartmoor visitor’s center it was once a hotel and it was while Sir Arthur Conan Doyle stayed here that he wrote part of the book, and researched the locations for the Hound of th e Baskervilles. I cut back across to the B3212 and headed towards Lydford Castle on the opposite side of the moor. 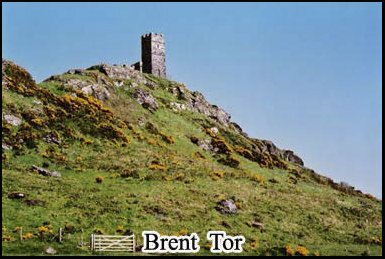 From several miles away you can see now see Brent Tor, this is where the Church of St Michael’s stands, perched on top of a rocky hillside overlooking a valley. From a distance it looks like it could be Dracula’s Castle, towering over the moor far below. 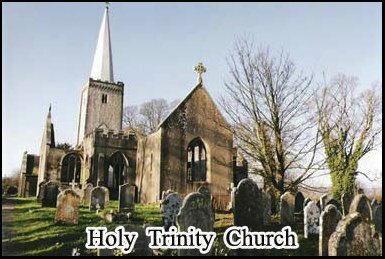 Although not haunted, a Dartmoor legend tells that the Church came about as a result of an epic battle between St Michael and the Devil in which good finally prevailed over the Devils efforts to prevent the Church from ever being built. 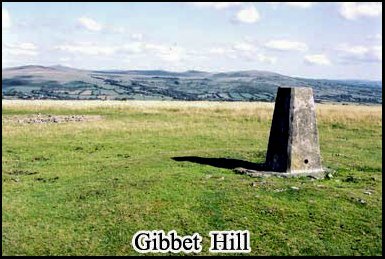 There was one more stop to make before Lydford, and that was to a place called Gibbet hill. Although it’s next to one of the few major roads that run through the park its not an easy place to get to. It’s unmarked and the actual location of the gibbet is on top of the hill but not visible from below. It was about a twenty minute hike up steep uneven ground to get there but aside from the fact that it is haunted it does offer extensive views across the moors. A gibbet is where the bodies of hanged criminals were put on display as a warning to others. This particular place was chosen as it was once an area that highway and smugglers used to pass through along the North West boundary of haunted Dartmoor. By the time you reach the crest of the hill and it flattens out, the road is no longer visible, and the only signs of life are a few distant farm buildings, and it’s a long walk back to the car. The haunting that occurs here is as a result of someone being put into the gibbet while they were still alive. If you don’t know what a gibbet looks like it’s a steel cage in the shape of a person that when strung from a tree or a post would suspend a dead body in order to expose it to the elements. The reason for this being that as birds began to peck away at the corpse or it started to decay; its appearance would become increasingly grotesque and act as a greater deterrent to criminals who may also end up in the same place if they themselves were caught. Being put in a gibbet while still alive must have been a long and agonizing death for a person, and it is these screams that are supposed to still be heard coming from the area on the hillside where this occurred. There is a stone marker to identify the location where the gibbet once stood, and this is an eerie place when the hill is covered in mist, then it is quite easy to conjure up pictures of highway passing by on here on there way across the hills. I stayed for a few minutes that made the long walk back down to the road. I back tracked slightly to make it to Lydford, which is a small village of no more then a few hundred people in the West of the haunted Dartmoor National Park. There are no street lights here and it is far from any of the main roads the cross the park. 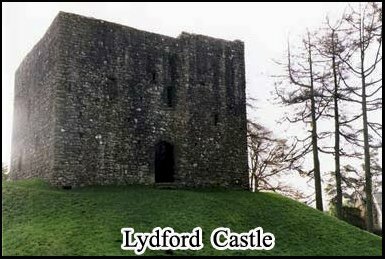 I was staying at an old Pub called the Castle Inn which is right next door to Lydford Castle, the Inn itself is supposed to be haunted possibly by one of the jailers that worked in the dungeons across from where it now stands. About half a mile a way is Lydford Gorge and the ghostly figure of a woman is said to appear near one of the waterfalls along the Gorge at a place known as “Kitty’s Steps”. It was just past four in the afternoon and after checking into my room I took the short walk from the Inn to the adjacent castle. The entrance is through a small wooden gate in the low brick wall that runs across the front of the castle grounds, there is no admission charge and the area is unattended. The structure itself sits upon a sloping earth mound that surrounds it several feet above street level. To the left hand side is St Petrocks Church, and beyond that some open fields. As castles go its certainly not on the scale of many that I have been to, being fairly small and basically a stone shell with one set of steps leading up towards its ramparts, and another at the end of a short walkway down into what was once the dungeons. But during the summer months in particular many people go out of there way to pay a visit here and have a drink at the nearby Inn. I made my way to the rear of the Castle which is furthest away from the street and up the step embankment to the entrance. I have been to many castles throughout England and Scotland, but there have been few where I have encountered such an oppressive atmosphere. As I stepped into the inner core of the building, although there were several people in the garden of the pub next door, you feel like you are the only person within several miles. I have since been back, and not had this feeling, and even returned once at night where I could barely see where I was walking, but there was still not the same sense of foreboding that there was now. The sun was just starting to get lower in the sky and at this point there was no one else actually in the castle or its grounds. The castle itself was built in 1195 AD and but was used as a prison and a law court, not as a fortress. The dungeons are below ground level and would have been windowless, cold and damp. It had been notorious for the harsh punishment of its prisoners and perhaps it is the horrors of what went on within its walls th at has somehow left a ghostly imprint hundreds of years later. 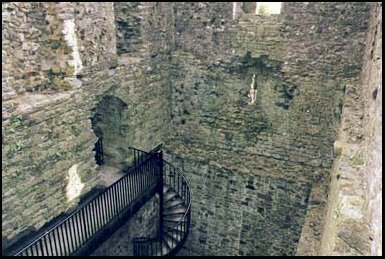 The main apparition that haunts the castle has been described as a black shape that has been seen passing through the dungeon walls, phantom voices have also been heard and cold spots felt. I peer over the guard rail in front of me down into the gloom; I am now several feet inside the castle entrance. To the left is a short walk way then some iron stairs that curve downwards to the lower level. I immediately began to experience a feeling of intense dread, as if I shouldn’t go down there. I looked around the empty courtyard below; there are several corners you can’t see behind from above and its one of those places that if you go to there isn’t a quick exit; you have no choice but to return back up the long winding set of steps that led you down. I took some pictures, and for a few moments the light from the flash illuminates the insid e of the castle but at the same time casting off strange shadows as it bounces off the walls. There are some more steps to the right of me that snake up to the top of the building; which will enable me to get a better view of the dungeons from the top of the ramparts. You enter them through a narrow stone archway, and climb up a long twisting stairway. It is very claustrophobic and all the way, I felt like something was coming up right behind me. I looked over my shoulder several times although I couldn’t see anything. I reached the top which is where the stairs dead end, and there is a small gallery where you can look down onto the floors below. I found myself drawn to a particular part of the dungeons; it was at the far end to the left hand side. I took a few more pictures from my location high above. You start to run through scenarios in your mind such as what if something started to come up the stairs from the dungeon, who would make it to the castle entrance first and what if you suddenly started to hear footsteps coming around the blind curve on the steps you just came up, then what would you do ? I stood in the gallery looking down to the floors below for several minutes, and then quickly made my way back down the stairs. Once I reached ground level I was again close to the castle entrance. I rapidly made my across the walkway and towards the stairs leading down. At this point I did for a moment consider leavi ng, but then that would defeat the entire reason for being here. There was a definite chill in the atmosphere and of course being in a castle surrounded by stone and damp earth you would expect that, but it seemed somehow out of proportion particularly as through the slits in the castle walls you could see that the sun still shone on what was an otherwise warm spring day. I looked ahead into the dungeons, mentally going over what path I would take once I got down there, and calculating how long it would take me to get back out if I needed to do so in a hurry. I begin the descent, at this point I could feel chills running up and down my spine. The stairway is made of wrought iron, and as a result your footsteps become slightly amplified by the echo they make. I now genuinely felt something was lurking in the shadows below. The light grows visibly dimmer and the entrance to the castle becomes further away, as I reach the final few rungs, the only way out is now a level above me. I leave the stairs and quickly walk out into the middle of the floor across the stone paving slabs, peering into the hidden corners that I hadn’t been able to see from above. I started to take several pictures in quick succession trying to cover as much of the area as I could. If you look up, you feel as if you are in the bottom of a big dark hole, above there is now an additional level of thick stone castle wall, before it opens up to the sky. I had been in this lower section for about ten minutes and the feeling that there was something else in there with me didn’t go away. I’ve been in many different castle dungeons before and most have a reputation for being haunted that is far greater then this, but very few have felt like this. A few minutes more and I decided it was time to leave. I turned and went back to the spiral stair case that took me back up to the ground level. I did feel an urge to get out of there as quickly as possible, and the faster I went back up the stairs the more noise my footsteps made pounding the iron stairway. It does get to the point that the slight echo caused by the vibration sounds like two sets of footsteps, although it was only one. I was now back at the walkway. I had I been here long enough. I exited back through the stone archway at the castle entrance and was now once again outside. But as I started to make my way back to the gate at the front, I certainly got the impression that whoever was once trapped in the dungeons may still be there. I returned to the Castle Inn, my room actually has a view of the Castle through the bedroom window, which is in reality only a few hundred feet away. As you try and go to sleep you can still see its ominous silhouette beneath the now starlit sky. I would return there several times in the next few months but not that night. The places I have visited today were just a handful of the infamous locations scattered throughout haunted Dartmoor which has to be one of the most mysterious places in England if not the world. Hey Buddy!, I found this information for you: "Ghosts And Legends Of Haunted Dartmoor". Here is the website link: https://www.chasingmidnight.com/haunted-dartmoor. Thank you.